Last week Apple reported that it has paid 20 billion dollars to app developers and Developer Economics produced a quarterly report on the “State of the Developer Nation”. Benedict Evans does, as usual, a great analysis of app sales across the two major platforms, iOS and Google. These articles describe amazing facts about app sales. 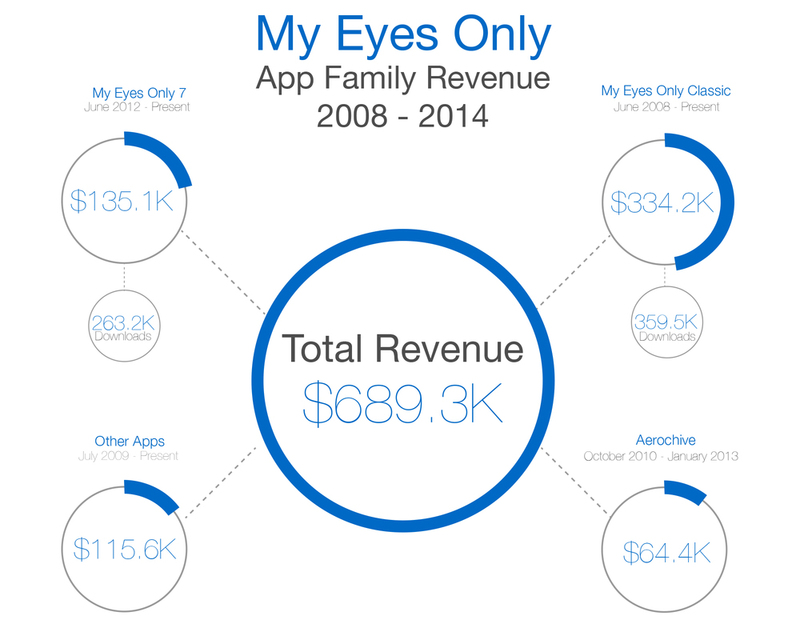 I have decided to share app revenues of Software Ops apps over the last six years. Software Ops app sales is smack in the middle of what Developer Economics calls “The Strugglers”. I will assess my reasons why this is the case in this three part blog series. Software Ops released My Eyes Only (MEO) into the Apple App Store six years ago, only two weeks after the App Store launched. Those days were amazing and exciting, when the bright and unsure future of MEO rested in the hands of early iPhone adopters. Early sales of MEO priced at $8.99 were enough to replace my low six-figure income. With the consistent revenue I quit my day job and founded Software Ops in my home office. At the founding Software Ops only sold one app. Since that time My Eyes Only has turned into two distinct apps, My Eyes Only Classic and My Eyes Only 7. The second app was an attempt to move the customer base from the original code base and design to the new code base and design. Moving customers to an all new app was the accepted approach at the time. Most customers moved to the new version, but some did not, resulting in two apps that have almost the same functionality. Both apps continue to earn Software Ops money and continue to get downloaded by the hundreds on a daily basis. However, an awkward situation arose for MEO Classic and MEO 7, as they are in two different Apple developer accounts and this makes it difficult to show charts of sales data that include both apps at the same time. Therefore in part two of the series, I will show a collage of charts of combined revenue numbers and other times show charts from each app separately. I reveal sales numbers to show my app revenue below, if you must see immediately. Before I do that, I would like to provide some background based upon my interpretations of my limitations and strengths. I am a developer and software architect; I know how to create high quality and easy to use software. My greatest strength is that I’m an excellent finisher. This means I complete projects and put on the finishing touches and send them off to market. Now that I’m a business owner I don't always have the time develop software, but I am always involved, even if it’s adding some finishing touches. After all these little apps are my blood, sweat and tears. Software Ops started out as a one man show, involving me, and my home office. Not to mention, the occasional pet or two, roaming in to knock something over. I’ve made a lot of progress in a few short years, today I have a fantastic development team, project management, and client management team. My team can build sophisticated mobile apps and cloud systems that interact with each app. We’re fantastic with client relations, and because we complete projects on time and ship software regularly into the market, our clients are satisfied and continue to do business with us. Even though Software Ops is an excellent product development company, it has gaps in app marketing capabilities. We have incredible insight on how to market our apps, but we don’t necessarily have the capital, organization or the structure to implement those insights. While we have updated and maintained MEO, we have not focused on it 100% over the last five years. However, my team and I have been working with businesses to create apps for their companies use. This has resulted in less focus on the original apps and more on the future of the company. I would say that we have only focused 5–10% of our efforts on MEO. In my assessment, these are the main reasons why My Eyes Only hasn’t generated more revenue over the past five years. Part 2 will consist of charts filled actual sales information along with historic analysis of app sales for MEO.